Hey everyone! My blog has moved. Head on over to www.turquoiseandchaos.com for new blog posts! I’ve always had super sensitive skin and finding products that didn’t make my skin break out has always been a struggle for me. After years and years of trying tons of different brands and products, I have finally found the perfect beauty products for my face. Today I am going to share with you My Daily Face Essentials. 1. Urban Decay Pore Perfecting Complexion Primer Potion – I never knew the importance of a primer until a couple of years ago. Now I couldn’t go a day without it. I have tried several different primers from different brands and even other Urban Decay primers, but none as good as this one. This primer minimizes the look of pores on my face and creates a smooth, airbrush finish. It also feels very light on my face compared to other primers that I’ve tried. My makeup holds all day thanks to this product with little to no touch ups needed! 2. Benefit Cosmetics Puff Off! – No matter how much sleep I get, I always wake up with dark under eye circles and puffiness around my eyes. I first purchased this product because I wanted to tone down the puffiness around my eyes without breaking the bank. I didn’t expect much from it, but Puff Off! has helped reduce the puffiness around my eyes tremendously. The cold metal iron applicator feels very nice on my under eyes and is very soothing. I’ve also noticed that the skin under my eyes has become very soft. I absolutely love this product and it has become a staple in my morning routine! 3. Urban Decay Naked Skin Color Correcting Fluids and Naked Skin Weightless Complete Coverage Concealer – I was so excited when Urban Decay came out with these color correcting fluids and they have quickly become my all-time favorite product! I have tried several color correcting primers, color corrector sticks, and other color correcting fluids but none of them did what I was hoping for. They were either too thick or provided no coverage. I have always struggled with dark under eye circles that made me feel super self-conscious. I use the peach color correcting cream over my Puff Off! and it completely covers my under eye circles! I also have a little redness on my face and the occasional blemish that I use the green color corrector to cover and after I apply my concealer and foundation, they are completely unnoticeable! The concealer has the same consistency as the color correctors and they both feel very light on my face. Both the color correctors and the concealer glide on smoothly, blend easily, and don’t settle into fine lines! 4. Urban Decay Naked Skin Weightless Ultra Definition Liquid Makeup – This is hands down the best foundation I have ever tried. After years and years of searching for the perfect foundation for my sensitive skin, I have finally found it! I have used other brands including Mac and Make Up Forever, but did not like any of them. I found that other foundations were too thick and caused my skin to break out. They also went on very cakey. The Urban Decay Naked Skin foundation goes on very smoothly, blends easily, and is very lightweight. It provides a natural coverage, but is also buildable. This foundation looks very natural and makes my skin glow. It lasts all day and doesn’t require any re-application. I have been using this foundation for years and it will forever be my go-to! 5. Laura Mercier Invisible Loose Setting Powder – I bought this powder on a whim when my local Sephora was all out of my regular setting powder. I have been hooked ever since! This powder works on any skin tone and sets your makeup with a flawless finish. It is non-drying and there is no build-up or residue. A little goes a long way with this product so it’s definitely worth the price! 6. Urban Decay x Gwen Stefani Blush Palette (No Longer Available) – This was a limited edition palette that I bought just to try out, but has become a part of my daily routine. As you can see from the products listed above I am a huge Urban Decay fan, but I’ve never really enjoyed their blushes. I didn’t expect much from this palette, but now I can’t live without it. This palette includes 2 blushes, 2 bronzers, and 2 highlighters. All of the colors compliment my skin tone perfectly and are easy to blend. I’ve hit pan on almost all of the shades in this palette and am devastated that I didn’t buy a second one for back up. I am currently on the look out for a new blush, bronzer, and highlighter so if you have any suggestions, comment below! While these aren’t the only products I like to use, these are definitely my favorites and I’ve found that these products work best for my skin. Let me know what your favorite face products are below! About two years ago I watched Gilmore Girls for the first time on Netflix. I binge watched all seven seasons in less than a month. Since then I’ve re-watched the entire series numerous times, falling in love with the show over and over again. When I first heard about the revival, I was thrilled. Although I was a little late hopping on the Gilmore Girls bandwagon, I felt like I was a resident of Stars Hollow and I couldn’t wait to see what my favorite mother-daughter duo was up to. The first thing I did when I woke up this morning was check Netflix to make sure that all four episodes were up as planned. The second thing I did was run out and get my favorite coffee (because how could you enjoy a Gilmore Girls marathon without coffee?!). I’m happy to say that I finished all four episodes today. I laughed, I cried and I was left with many, many questions. I’m already thinking about re-watching it (it’s not too soon, is it?). Whether you’re watching the revival for the first time or re-watching it for a second (or third or fourth) time, I thought I’d round up a few must-haves to get you through Gilmore Girls: A Year in the Life. 1. Coffee – An absolute necessity in ANY Gilmore Girls binge session. And after waiting almost 10 years for this revival, I think it’s safe to say that we could all use coffee in an I.V. My personal favorite is a Caramel Mocha Iced Coffee with Almond Milk and 2 sugars, but any coffee will do! 2. Junk Food – It’s no secret that Lorelai and Rory love to eat junk food. Today in Gilmore Girls fashion, I am munching on pop-tarts, french fries, ice cream, and potato chips. And of course with it being the holiday season, I have a perfect excuse to pig out on my favorite snacks. 3. Comfy Clothes – Lorelai and Rory sure know how to dress up for Friday night dinner, but they also have no problem rocking pajama pants and Ugg boots. With each episode of the revival being over an hour long, comfy clothes are a necessity! Today I am wearing my comfiest yoga pants and my favorite hoodie, the perfect outfit for staying inside all day. 5. 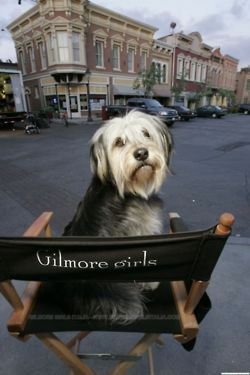 A Dog – I spent my day snuggled up and watching the revival with my very own Paul Anka and so should you! And of course your furry friend is going to want to see what everyone in Stars Hallow is up to too! Well there you have it! I hope you’re all watching and I can’t wait to hear your thoughts! Comment below with your Gilmore Girls Revival Must-Haves and let me know what you think.